Welcome to my pencil pet portrait artist gallery. All of the pencil portraits below have been hand drawn by myself. 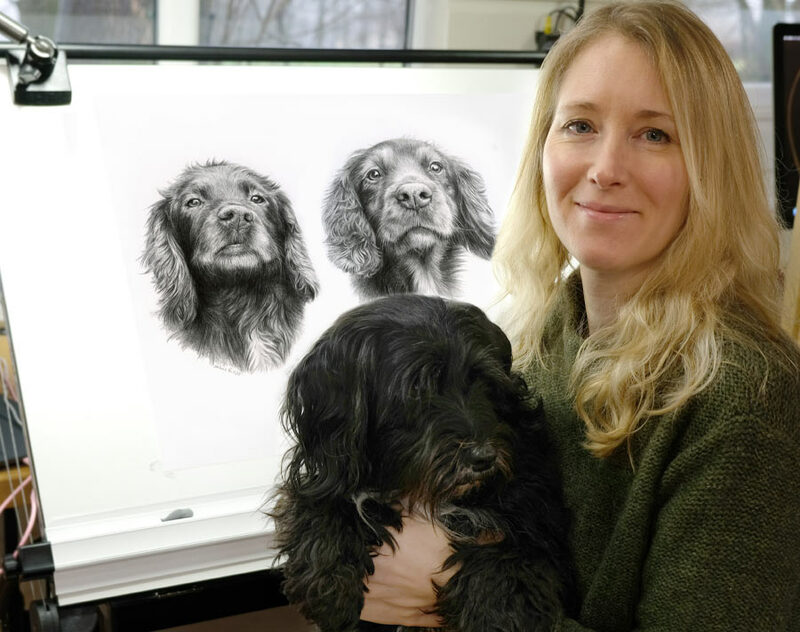 I have such a wonderful job and am very lucky to be able to sit at my drawing desk every day and portray all of the wonderful dogs, cats and horses that clients commission me to draw. I have collated a few of my personal favourite pencil portrait commissions here from over the last few years. As you can see I can draw all animals - dog, cats, horses, widlife and farm animals. I am commissioned far and wide for my portraits and it's so lovely to think that my drawings reside in far flung places from Australia, USA, Singapore, Hong Kong, France and Italy to name a few. I love chatting to my clients via email form around the world too. The portrait of Stormy was a 12 x 10 pencil drawing framed in our Madison Slate frame with an accompanying silver plaque. Sadly stormy had passed away and Michael and his family wanted a portrait from one of their favourite photos to remember her by. It was such a perfect photo and one of my favourite portraits to date. Michael telephoned me personally to thank me for the drawing. I spoke to him on a number of occasions which was really lovely. I am so thrilled they love the portrait of Stormy. Brodie was commissioned by Sandra who wanted a portrait of their spaniel as a birthday present for her husband Dave. The pencil drawing was an 18" x 14" portrait drawn in 2018 and I loved every minute. I adore drawing spaniels, especially all of those curls! I hope you like Brodie and the photo Sandra took of Dave with Brodie and the portrait too! 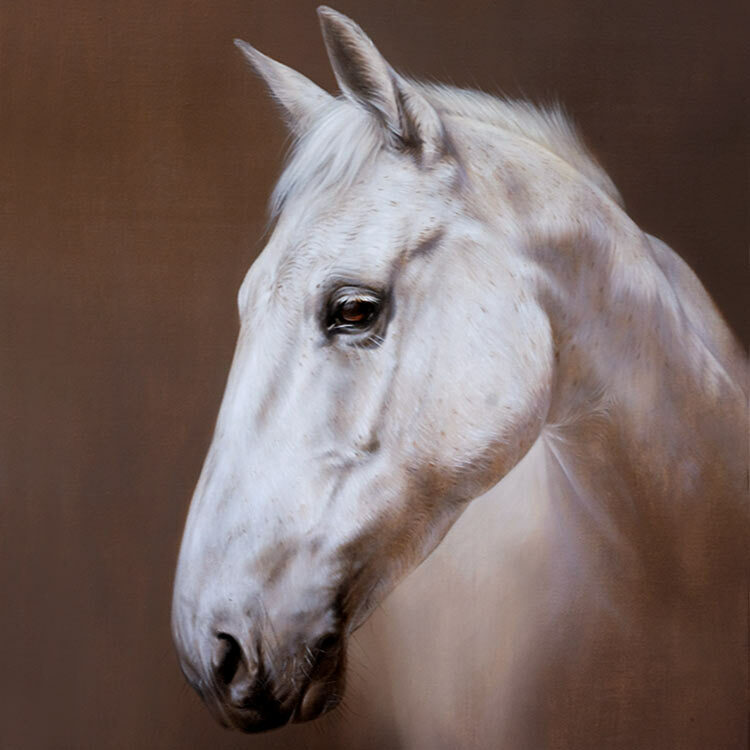 The portrait of Flash was commissioned by a returning client in Australia. Jo and her daughter missed their pony Flash tremendously when he passed away suddenly and unexpectedly. 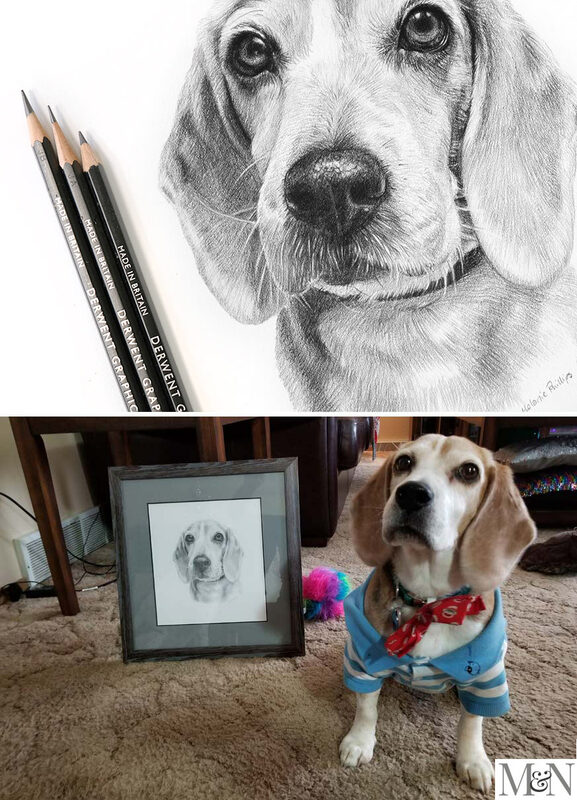 They both wanted a large pencil drawing to remember him by. The portrait was a 30 x 20 inches pencil drawing and you can see the scale in comparison to my pencils in the photo of the drawing below. 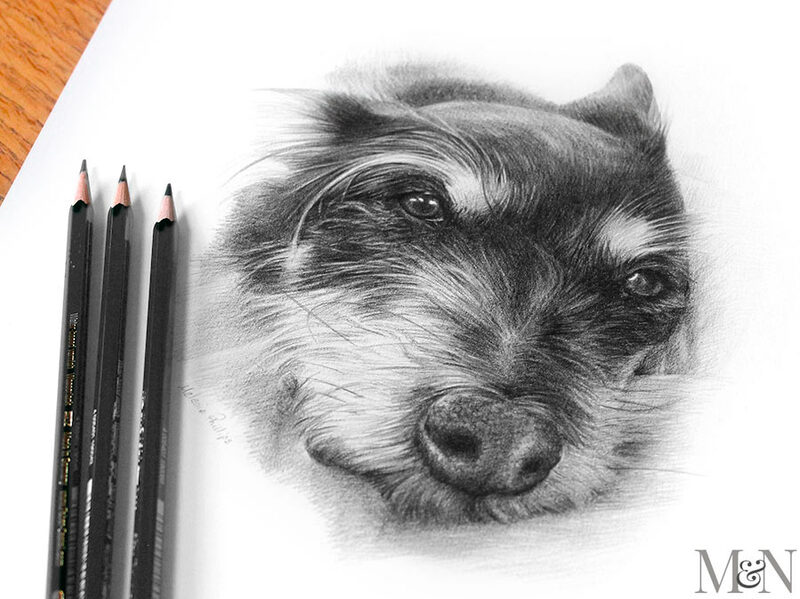 The pencil drawing of Biscuit was commissioned as a surprise gift form one friend to another. 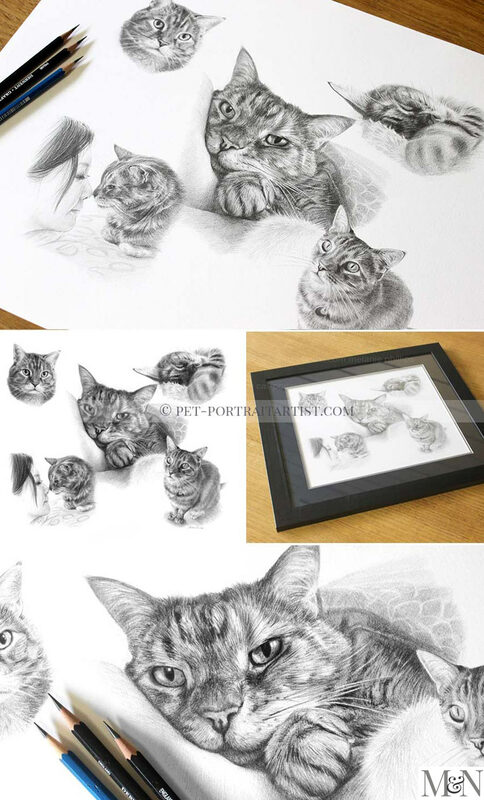 Sadly Biscuit passed away and was a very special friend so deserved to have a very special portrait. 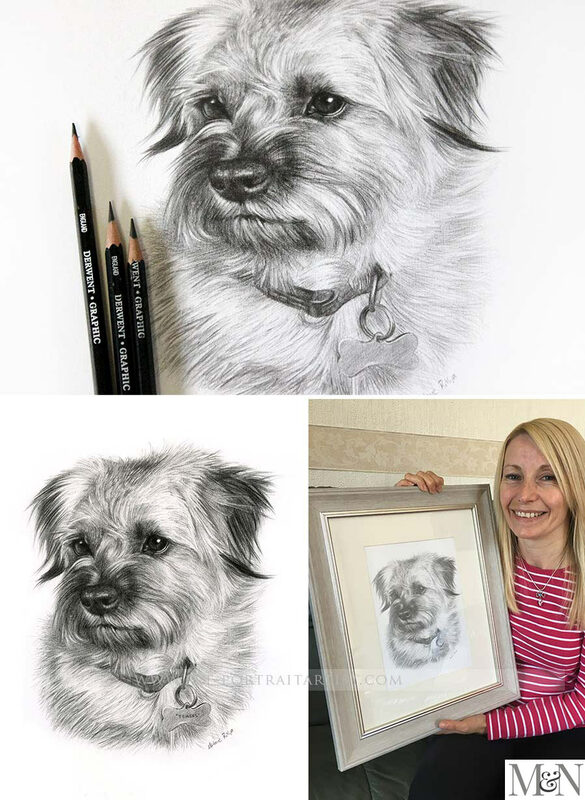 I thoroughly enjoyed drawing Biscuit and the client was delighted with the results. The portrait of Blue was commissioned by returning client Ben as a surprise gift for his wife. Ben very kindly took a photo of blue with his portrait and you can read about it in Ben’s email below. I have created a few portraits for Ben and his family which is wonderful. Melanie, Yes he sits pretty well. Especially when I am holding treats in my other hand! It was ungodly cold in the Midwestern US last week so he had a shirt on just to keep the chill off. He is a sweet little guy. Much thanks to you for your wonderful work. 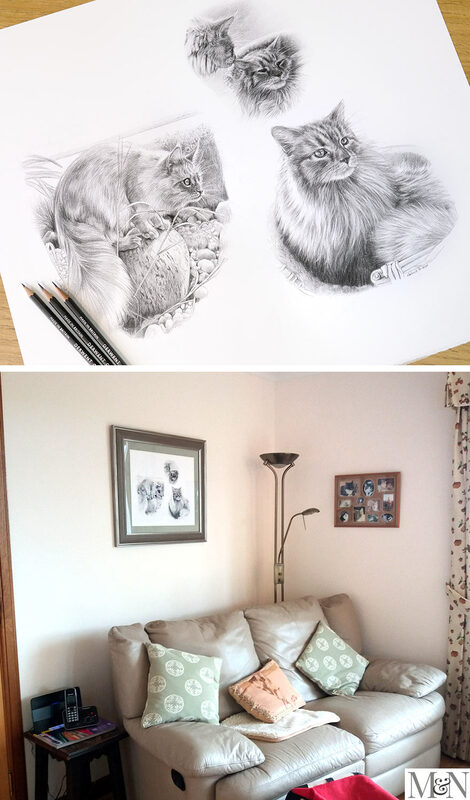 Kevin based in the USA, commissioned a pencil drawing at 18 x 14 size of his two cats as a surprise gift for his wife Erika. The portrait was frame din our Madison Slate frame with a double mount. The inner colour is a dark grey and it really goes well with both the frame and drawing enhancing it beautifully. Erika is going to love it! In 2016 Paula commissioned me to draw Teasel, who had sadly passed away. She was just so beautiful and I really enjoyed drawing her, Teasels eyes were wonderful to portray. Paula was thrilled with her portrait and said it felt it was like having Teasel back with her, which is just amazing. You can read a snippet from one of Paula's emails below and see a photo of Paula with the framed portrait. 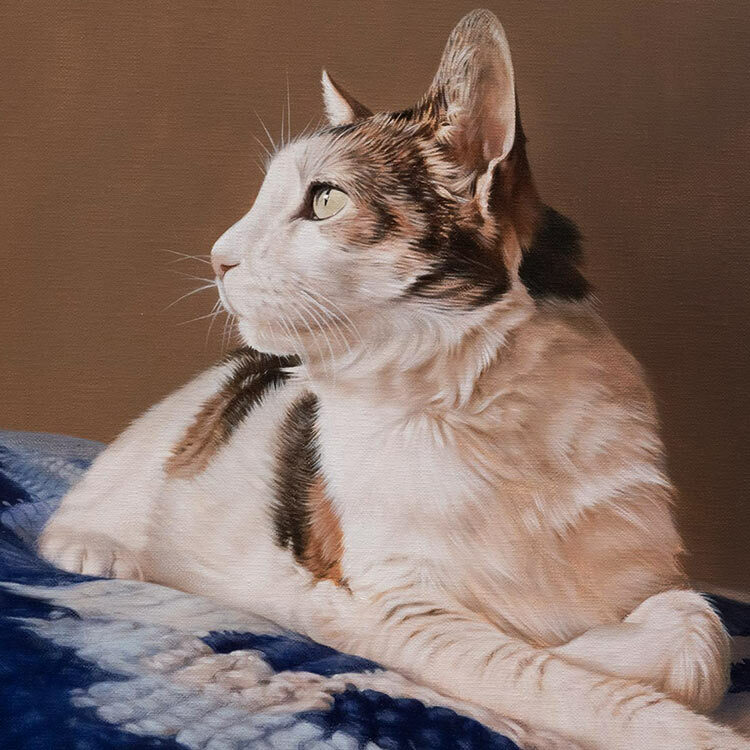 This is one of my favourite cat portrait to date and it is of a gorgeous cat called Gilli. My client commissioned a montage drawing as a birthday gift and if you scroll down you can see a video of it. Hi Melanie, Thank you so much, its perfect! My friend will love it. Vivian. Back in December 2015, Simon called me to make arrangements to send a voucher pack to his brother Adam as a birthday present. He thought it might be a lovely idea to have a portrait of his current dog Willow. Adam contacted me with a slightly different request. 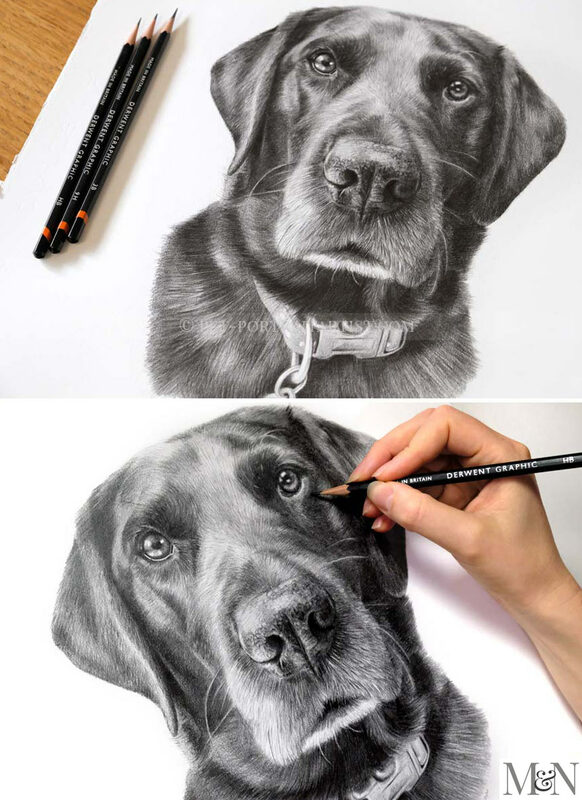 He wanted to have a drawing of his previous dog Poppy as they missed her and wanted an ever lasting memory of her. Adam had taken some amazing photos of Poppy and all was arranged. Then a UK Learn to Draw magazine emailed me to ask if it would be OK to feature my artwork in their upcoming edition. 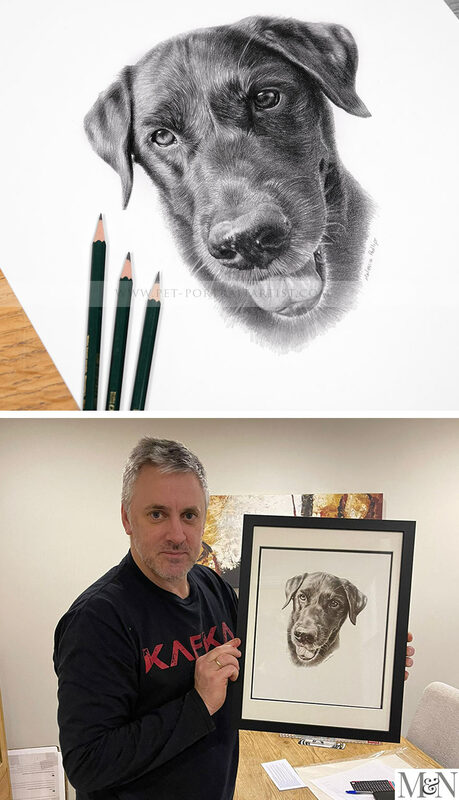 I was thrilled and immediately thought of the commission of Poppy as i knew it would work really well to help budding artists understand how to create a portrait in pencil of a dog using lots of different techniques. Adam was thrilled and was excited to see not only Poppy’s portrait, but poppy in print too! You can see a number of stages from the magazine, the final stage of Poppy and the portrait framed too. One of my favourite portraits of 2016 was of a gorgeous Tibetan Terrier called Hollie. 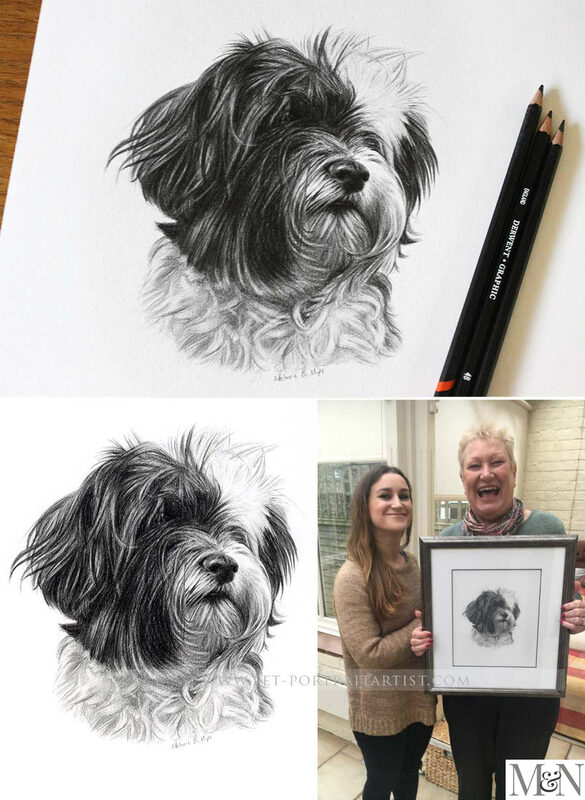 I absolutely loved every minute of drawing Hollie as I also have a Tibetan Terrier. Caroline commissioned me to draw Hollie as a surprise gift for her mum. The portrait was very well received as you can see from the fabulous photo of Caroline and her mum below. I love it! I hope that it will be an ever lasting memory of their very best friend. Tracy, a returning client, commissioned me to draw her beautiful cocker spaniel called Moo. 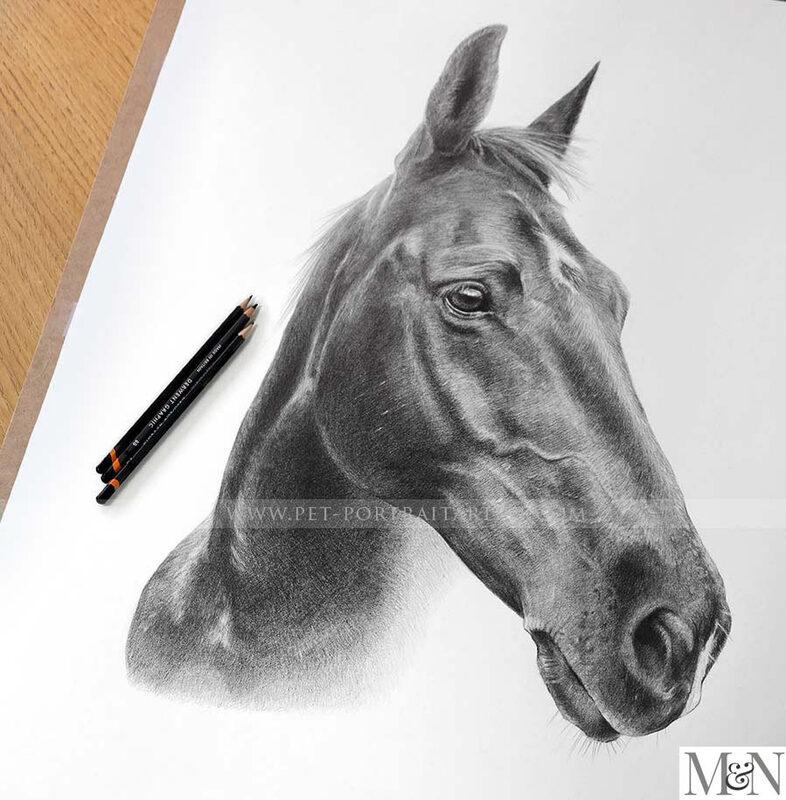 They are one of my favourite breeds to portray and I thoroughly enjoyed drawing her. We framed the portrait with our local framer and Tracey took time out of her busy schedule to collect the portrait from our studio. We took the opportunity to take some photos of myself, Tracey and Moo with the portrait which you can see below. 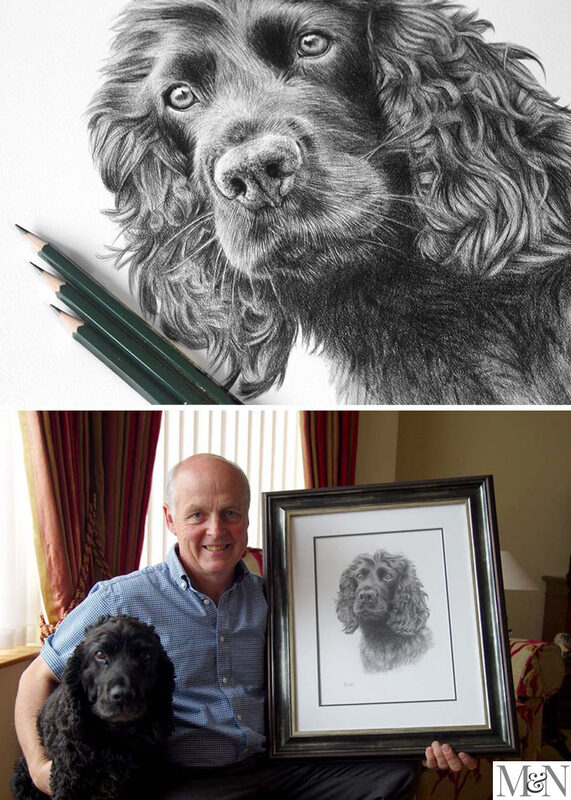 The pencil drawing of Ollie was commissioned by Steve as a Christmas surprise for his wife. The portrait was a 16 " x 12" pencil drawing and you can see a photo of my hand and pencil on the photo below. Thank you, the portrait arrived safe and sound. Will save the grand unveiling until Christmas day!! Thanks for all your hard work. Sylvia called me in the studio from Guernsey asking if i would be able to create two portraits for her, both framed. One was to be sent direct to her son in England and the other was to be sent to the USA to her granddaughter and family. Sylvia initially wanted them to both be completed before Christmas, however I was fully booked and overspilling into the following year. So Sylvia opted for email vouchers to be sent and the portrait to be completed in January. 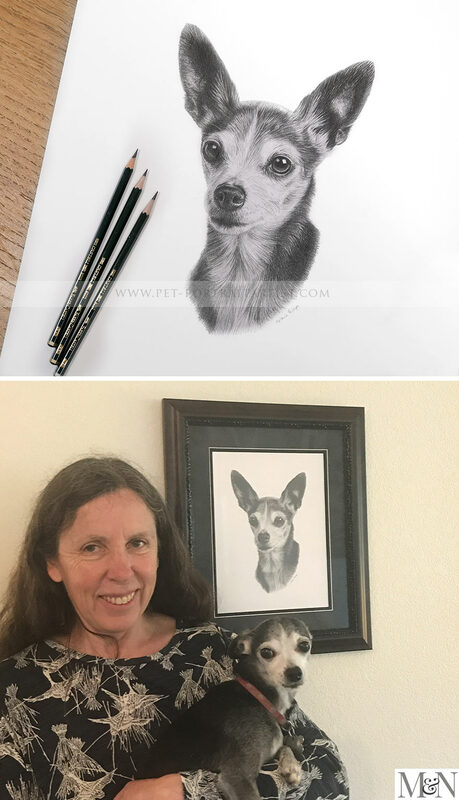 The first portrait to be completed was of Mango, her son's dog who sadly had been put to sleep that year and their entire family missed him tremendously. I have added a photo of me drawing, along with photos of the portrait framed, with a detail of the silver engraved plaque. Sylvia visited her son a few months later and very kindly took a photo of him with the portrait. I am so thrilled when my clients take photos of the portraits - even more so when they are in the photos too! Steve Thomas emailed me asking if i would be able to draw their dog Ziggy, a gorgeous Cockapoo, as a surprise gift for his wife's birthday. His email read..."I realise that you currently have quite a waiting list and therefore I am keen to add my name to this as soon as possible, especially since, if possible, I would really like the picture for a specific date." Both Nicholas and myself have a commissions list and its great when our clients are organised and arrange their portraits with plenty of time to spare! 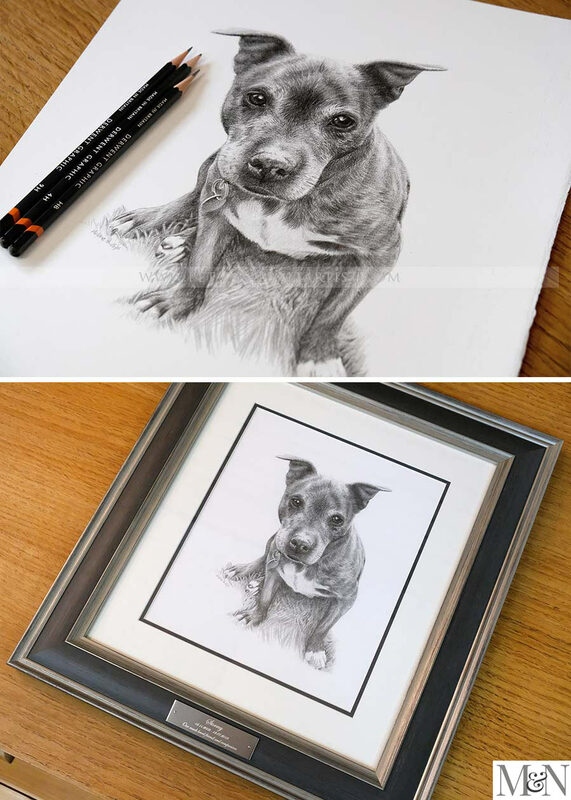 The portrait of Ziggy was drawn at 20 x 16 size and framed using our Windsor Wash Frame. Steve’s wife was thrilled with the portrait and one of Steve's emails is below. Stephen Humes commissioned a large drawing of his three Huskies as a surprise present for his wife’s birthday. I enjoyed every minute of this commission as it was so special. There were lots of details to discuss with Stephen from getting good quality photos of the dogs, the composition, the framing, plaque etc. Sasha, Bear and Punky all had amazing blue eyes and so we decided it would be great to have those in colour. I’m not sure if you can see from the final photo as it was so difficult to photograph each dog, however I painted the eyes in watercolour and used coloured pencil for the detail. It worked really well. I also shaded the background a little, again it hasn’t come out that well in the final photo, however it was a gentle shading so that their white fur could stand out from the background. Stephen chose a Driftwood French Grey Frame with a silver engraved plaque to complete the portrait. Stephen's wife was thrilled with the outcome and they very kindly sent me a photo of the portrait when it was framed and displayed on the wall. You can also see a photo of me with the painting in our studio when it was complete. In 2017 I was asked to draw two cats, one pictured below, for Macadams pet foods. They currently only make food for dogs, however are introducing a new range to their foods in the coming months for cats. Their usual in house illustrator was away on holiday and was unable to complete the illustrations in time. So I stepped in and you can see one of the drawings below along with a box of food from the dog range. I really look forward to seeing the cat food range for sale soon! 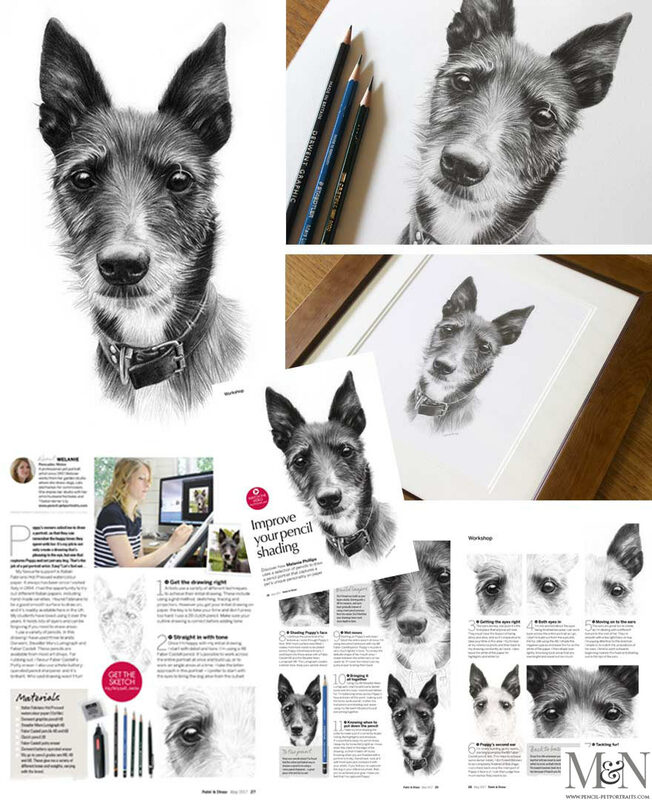 Elizabeth emailed me some wonderful photos of her dog Bea in 2015 asking if I would be able to create a head study portrait as a surprise present for her husband. One photo stood out as being perfect for a drawing and you can see the photo and the drawing below. Elizabeth very kindly took some photos of Bea with her portrait and you can also see her lovely testimonial below. Hi Melanie, We have had builders in, unfortunately for rather longer than planned, so I have decided to send you some photos of Bea and her portrait in the meantime. The picture is a perfect likeness of Bea and also a beautiful drawing in its own right. Charles loves his present and we can't wait to hang the drawing once we have our house back to normal.